They swore to Jason that there was nothing genuinely illegal about building a secret satellite tracking station…just smart businessmen getting the jump on the stock market. And for half a million dollars, Jason Theiss was ready to believe them. That was before the murders began, and before some over-anxious governments decided to muscle in. Seeing as how the previous two reviews have been about books that, for one reason or another, I’ve had a lot of trouble concentrating on, this book came as quite a relief. This is not to say that it was especially good, but at least reading it got me into sort of a groove. I was able to concentrate for all of the two or three hours it took me to read the thing. It felt amazing. I think part of that is thanks to the author. You see, the author of this book is in fact that Gary Paulsen. I don’t know ’bout you, but Paulsen was the stuff when I was in middle school. I’ll be honest, I didn’t read any of his books, but I was well aware of them. I can practically recite the plots to Hatchet, The River, and Brian’s Winter not because of my own efforts, but because I sat through so damn many book reports by everybody else in my grade. I’ve often wondered how universal that is, at least to people of my generation, and how much of my experience with those books owes itself to growing up in rural Appalachia, where getting someone to read a book at all is about as likely to work as flying a steam shovel to the moon. Putting that book in the woods, though, is tantamount to sticking that steam shovel on a Saturn V. At least now there’s a chance. I didn’t know he’d written much beyond those books, and so I was surprised when A) I found this one at a friend’s house and B) I looked him up. Dude wrote a lot of books. A lot a lot. It’s interesting to me that somebody who’s been called a Luddite wrote so many books that show up on the ISFDB, which brings me to a different issue. Look at that cover. I mean, just look at it. This is one of the most misleading covers I’ve ever seen. 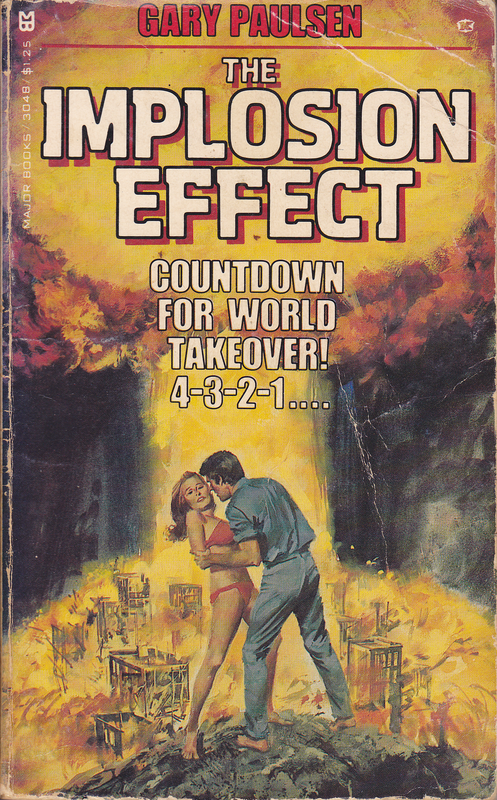 Some kind of nuclear explosion is happening while Ted Danson tries to kiss that girl. Why is he barefoot? I mean, I can understand why the girl is barefoot. She’s barely got anything on at all. She’s been to the beach all day, blissfully unaware that Cheers, and with it all that has ever been good about American sitcoms, has gone up in a radioactive fireball. This cover has nothing at all to do with the novel. What we’ve actually got is a fair-to-middlin’ murder mystery that takes place on an island and is written by an author who did a lot of research on satellites and how they work and then made a character to tell us about all that research. Our (anti)hero is Jason Theiss. He’s better than most protagonists I read about. He’s competent and useful. I appreciated that. He’s also not very likable, but that’s intentional. He’s an alcoholic with a lot of personal problems. He’s also a skilled satellite tracking station engineer, but he’s been out of work since Lockheed gave him the choice between his job and the booze. He chose the booze. Jason is the result of an attempt to write a character that is something like Sam Spade, Philip Marlowe, or Travis McGee.The kind of character whose problems are only matched by the ones he’s trying to investigate. The problem is that Jason Theiss doesn’t really belong in that group because he’s not a professional detective, salvage consultant, or whatever. He’s an engineer. He just also happens to have these attempts at hardboiled one-liners that weren’t all that good and some personal problems that were, on the whole, a little too predictable. So one day, while sitting on the beach drinking bourbon and feeling sorry for himself, Jason gets kidnapped. It made for an interesting start to a book. Boat pulls up, Jason gets sapped, he wakes up when he gets loaded onto an airplane, and then the story is told. So this guy, Alan Gunderson, has got a proposal. Jason will design and build for him a satellite tracking station on a remote desert island that he and his business partners can use to bootleg information from existing American satellites. It’s not strictly illegal, everybody says, just a little on the shady side. These businessmen want to use the satellite information to play the stock market. Get a little forward warning when, say, a drought is going to affect Central Russia and drive wheat prices up. That kind of thing. Gunderson offers Jason a great deal of money, which Jason accepts so the book can happen. We meet Jason’s team of specialists, four men and one woman whom Gunderson claims are the best in their fields. The most notable member of the team is Jean, a gigantic Frenchman who is basically André the Giant. He’s in charge of antennas. Jason and Jean become fast friends after they have a fistfight so they can prove to each other how little guff they will each take. When it is clear that guff-taking will be kept at a minimum, they earn each others’ respect. Aw. We also meet Alice. She’s the T&A of the work for most of it. She and Jason get into a relationship after the requisite amount of playing hard to get. The book is good when it comes to understanding how satellites work. I could tell Paulsen did a lot of research when it came to the technical aspects of this book, or at least he talked to someone who had. It was something I appreciated. Jason and the team manage to get a satellite tracking station up and going in about a week. One of the things they do is use the volcanic crater on the island as the satellite dish by covering it in tin foil. The book assured me this would actually work and gave me some pretty convincing reasons as to why, but I’ll be honest that I don’t know whether that would work in reality or not. I tried doing some research and all I could find was that the Arecibo Observatory was built in a large crater-like depression that is actually a sinkhole. Some minor details that start coming up are the fact that Gunderson has no idea what he’s doing and a dead body that washes up on the island right as Jason is trying to make out with Alice for the first time. Thus begins the murder mystery portion of the book, which is actually the entirety of the book. All the satellite stuff takes a back seat to figuring out who the murderer is, and since there are only seven possible people, that means everybody gets all suspicious and antsy about it. The dead body isn’t anyone that our cast knows, which makes it even more mysterious. It’s been shot clean in the forehead and the island is far from any tourist or shipping lanes, so it’s apparent to everybody that the body did not come far. Apart from being a murder mystery the book is a tense interpersonal drama, or at least it tries to be. A lot of it is just “everybody is suspicious of everybody else.” Most of the folks think that Gunderson is behind it, considering that he’s a capitalist and is therefore liable to do anything unsavory to make a few extra bucks. That’s fair. Eventually there’s another murder. This time it’s one of the group, the woman. Not Alice. The other woman. Helen. She was one of the technicians. She was also in a relationship with Jean, which means that now our gigantic Frenchman has become completely unhinged. More personal drama. Jean assumes it was Gunderson. He grabs him, hogties him, and places him in the middle of the giant satellite dish crater to bake alive. Meanwhile Jason is trying to find some evidence, even if he does agree that it was probably Gunderson. Logic says that it could be almost anyone except our viewpoint character and, probably, Jean. So those two are dismissed. Where the book fails is just how many times Jason considers Alice, his girlfriend, and immediately dismisses the thought as impossible. For no real reason. It’s just always “Well it’s obviously not Alice.” It was clunky and of course every instance of that phrase or a similar one just reinforced the fact that it was quite obviously Alice and now the real question is figuring out why. Another team member dies. This time there was a loose wire behind a computer console and it electrocuted him. It’s pretty obvious that it was a trap. Obviously it’s not Alice again. The way that Alice gets caught is pretty nifty, though. At some point Jason figures that the most likely suspect is the pilot that ferries Gunderson back and forth from the island to the mainland for supply runs and so forth. He gets a small capacitor nice and charged and sets it down somewhere. When the pilot is around Jason asks him to pass him that boxy thing there. Since it’s pretty easy to pick the thing up wrong and shock oneself accidentally, anyone with any electrical knowledge at all will pick it up the right way, thus exposing themselves as the person with enough electrical knowledge to set the trap that killed the last guy. Or something. The pilot shocks himself with it. Jason points this out and Alice just spills the beans. She’s a Chinese spy and this whole operation has been an attempt to hijack American satellites. It’s not the satellites themselves that are the important part. The Chinese can use their own spy satellites for that kind of thing. The whole deal was set up so that Jason would divulge the secret code that, apparently, allows access to any satellite launched by the United States of America. I’m not sure how accurate that is. I feel like it’s not very. Somewhere along the line Jason would have had to use the code to get some information from a satellite. That means the code is stored on one of the magnetic reel-to-reels they’ve been using to record data. With this code, Alice and her commie pals could take control of every American satellite and de-orbit them, crippling the American communications network just before sending the world’s largest standing Army to march all over American soil. So Jason can’t let that happen. He tells Jean what’s going on. Gunderson, incidentally, is just a pawn in the whole game. The Chinese figured that capitalist greed is the gateway to all sorts of awesome spy stuff, which is probably right. It also explains why Gunderson had no idea what was going on at any point in the story. At one point he basically says “Wait a minute, you mean that satellite is in space?” It was kind of adorable. About the time that Alice tells our hero all this information, a submarine surfaces nearby and several Chinese soldiers invade the island. Jason, Jean, and Gunderson are on the run. They see several of their pals get mowed down. They’re the only three left. I think the pilot is also still alive. Four left. Jason somehow ascertains that the Chinese haven’t gotten the codes off the magnetic tapes yet, so he uses some dynamite to blow up the shed. He has a final confrontation with Alice in which she is killed, but not before she tries to tell Jason that she still loves him so why doesn’t he just come back to China with her. He declines and shoots her in the head. The ending of the book is about what you’d expect. Our remaining heroes leave the island while Jason stares off into the sunset thinking about how crummy his life is and how it’s even worse now that he had a brief moment of happiness with a woman who turned out to be a spy. I think we can all relate. All told this book was not bad, which is nice, and also it took me a very short time to read it, which was also nice. It clocked in at about 180 pages, but here’s the thing: those pages were super-short. Let me go get a ruler so I get all this right. This paperback measured 6 7/8 inches by 4 1/2, a standard mass-market paperback size. But the margins, jeezy creezy, were just massive. An inch on top and a 1 1/8 inches on the bottom. That’s a third of the vertical space of the page. If a third of each page is just white-space, then it seems to me that this 180 page book is effectively 120 pages, unless my math is wrong, which is extremely likely. Let me know in the comments how to more effectively figure that out. The other thing about this book is that I have no idea why it’s labelled as science fiction. Sure, it’s got some sci/tech type stuff going on, what with the satellites and all that, but those things have absolutely nothing to do with the story, which is just a regular old murder mystery that turns very briefly into a political thriller or something. It reminds me of how I felt about Gravity when I finally saw it. People were calling it a science fiction movie but really it’s not, even though it takes place in space. In a way it’s exciting that we’re reaching a technological point where just being set in space does not necessarily mean that something is science fiction. That movie was just a drama that happened to be set in Low Earth Orbit, using technology that is already available (although not treated realistically). This book is even more like that. It’s just got satellites. Maybe in 1976 thinking about satellites was weird and crazy, but I somehow doubt it. We were launching them. They were routine. This book isn’t sci-fi any more than a book about cars would be. It wasn’t nearly as memorable as Paulsen’s books about roughing it in the wild and becoming a man in the process, but it was okay.